People through the country are talking about sexual abuse. We hear about sexual violence on social media, in newspapers and television, while discussing the presidential election, and while watching sports. 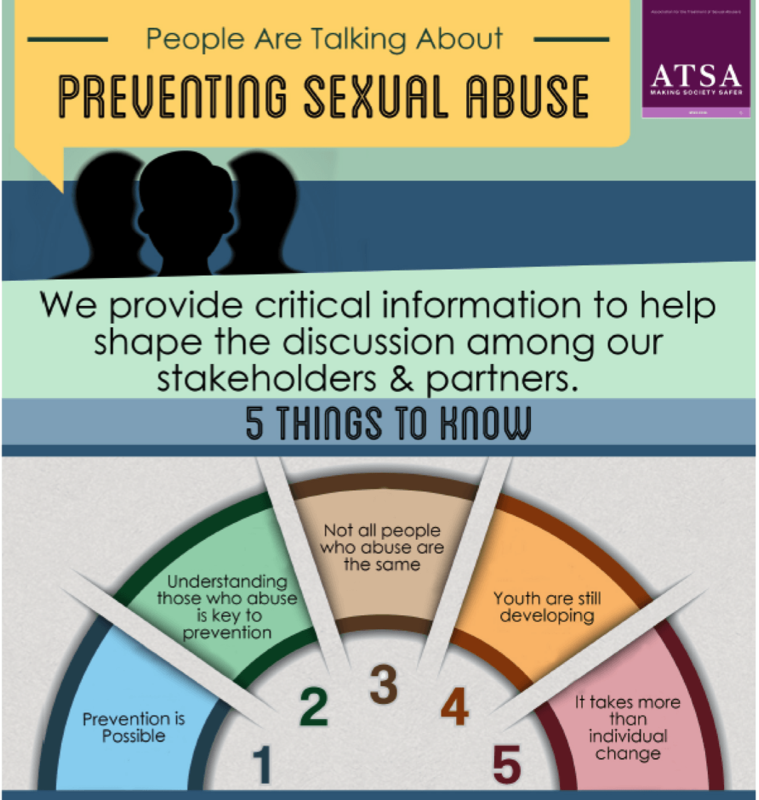 Last week, the Association for the Treatment of Sexual Abusers (ATSA) released an infographic highlighting 5 things to know about preventing sexual violence. Understanding those people who abuse is key to prevention. Not all people who abuse are the same. Children and Adolescents are developing. Change the environment: It takes more than individual change. As our partners and potential partners become interested in preventing sexual violence before anyone is harmed (primary prevention) there has been a growing interest in what it means to prevent the first time perpetration of sexual abuse. To understand this question, one must be able to talk about those who perpetrate sexual abuse and understand both the risk factors and the protective factors for first time perpetration. This is the core of ATSA’s expertise and this document is developed to help ATSA members bring their unique contribution to the prevention conversation. Click here to get more information and download the full infographic.